Thanks to all of you that came along to participate at our 2nd Annual Meeting in Sheffield in June 2018. The meeting was held over two days (coincidentally the same dates as the Launch Meeting!) at the University of Sheffield in Inox and was attended by more than 80 people. We are extremely grateful to the host of fantastic speakers that helped us to make this event such a success, from our Champions, to our Scoping Award Winners, many of the UK's major funders and colleagues and friends of the Network. We also had plenty of opportunities for networking and we're already starting to see new collaborations springing up from contacts made on the day. Thanks to all of you that attended our Launch Meeting in Manchester. 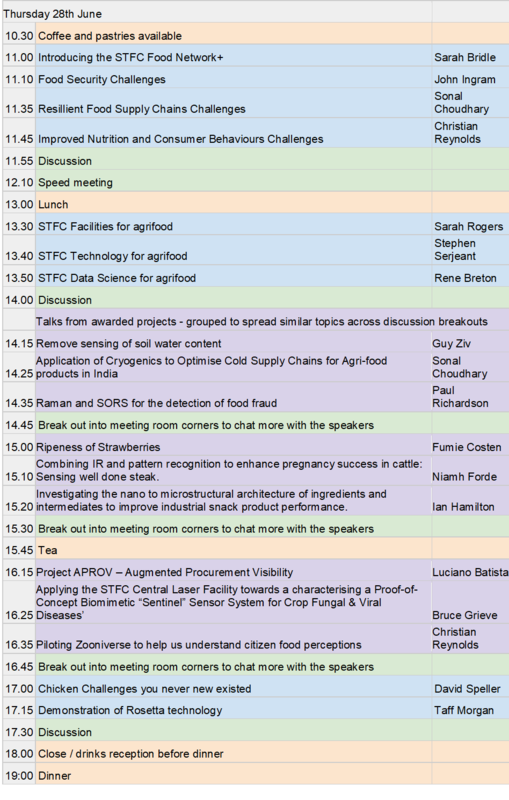 The meeting was a great success with lots of new introductions being made and some great opportunities for knowledge share on the STFC Physics and AgriFood communities. The event was free to attend and consisted of a series of talks by expert speakers on topics spanning the STFC and Agri-Food sectors along with interactive sessions and networking opportunities. 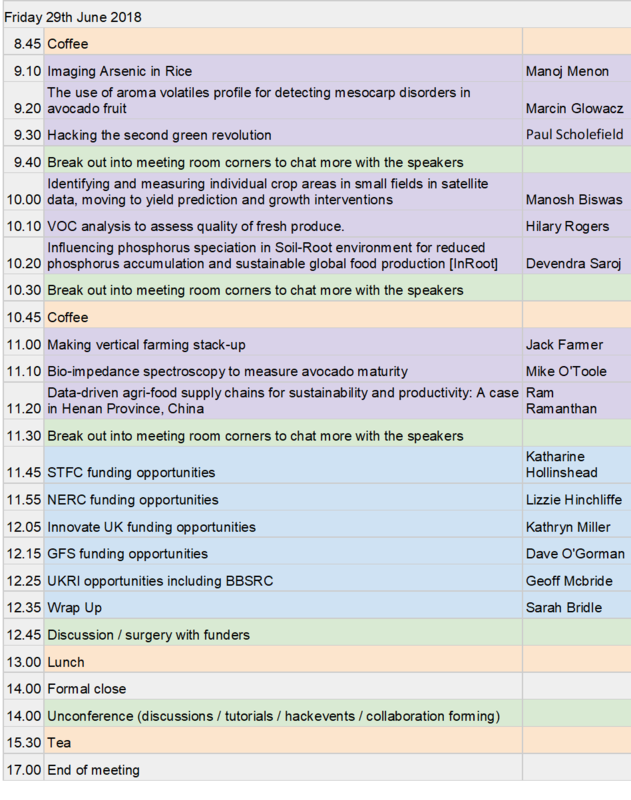 You can see our agenda, followed by biographies for our speakers and copies of their presentations below. Geoff McBride's current position is with the Science and Technology Facilities Council (STFC) Futures Programme working on Grand/Industrial Challenges of: Defence, Security, and Resilience, Energy and Environment, Global Food Security, and Healthcare. Geoff's role requires him to conduct analysis of these themes and their dependencies interacting with the UK Science Base by leading workshops and creating futures publications and products as an enabler for the UK Science Strategy the aim of which is to fund and deliver solutions and opportunities to Grand/Industrial Challenges for Government. Geoff is the Principle Investigator on a project collaborating with the Portugal and the Royal Berkshire NHS Foundation Trust for Remote Sensing systems for Hazardous Environments. As the Theme Leader for Global Food Security & Agri-Tech Geoff represents STFC in this theme at the Research Councils, UK Government and other international collaborations (China, Turkey, Portugal, USA, others). Geoff is also Director of Appollitron Ltd his own science and technology consultancy firm. Sarah Bridle obtained her PhD from the University of Cambridge, UK in 2000 and was made Professor at the University of Manchester, UK in 2013, after research in France, Cambridge (UK) and London. She has won prestigious awards in the UK and Europe including a Royal Society University Research Fellowship, the Royal Astronomical Society’s Fowler Award, a 1.4 Million Euro European Research Council Starting Grant, and a 2 Million Euro ERC Consolidator Grant. She is author of over 70 refereed publications which have over 3500 citations. Most of her work so far has focussed on trying to uncover the nature of dark energy using gravitational lensing - the bending of light by dark matter. She led the first cosmology constraints from the biggest ongoing cosmological imaging survey, the Dark Energy Survey, which is imaging one eighth of the sky and measuring shapes and approximate distances to 300 million objects. She has also worked on the largest ground-based optical imaging survey of the coming decade, the Large Synoptic Survey Telescope (LSST), which will image the entire southern hemisphere once every 3 nights for 10 years. She co-led a consortium of hundreds of UK academics as founding Project Scientist of LSST:UK, bringing 17.7 Million pounds from the government for the UK to join this US-led project. Motivated by the need to reduce global greenhouse gas emissions, she has diversified her research interests to applying her cosmology experience to agriculture and food research with the aim of reducing the impact of food on climate change and mitigating the impact of climate change on food. ​She is now spending half her research time on agriculture and food, including applying astronomy techniques to image analysis in agriculture and leading the STFC Food Network+. Katherine Denby is Academic Director of N8 AgriFood and holds overall responsibility for the development and management of the five-year, cross-institution programme. Professor Denby works with N8 AgriFood’s core team at University of York, and with programme colleagues across the eight universities to promote collaboration in the AgriFood arena. She encourages new collaboration between research groups from different disciplines and looks to enhance engagement with the private sector along the AgriFood supply chain “from farm to fork”. 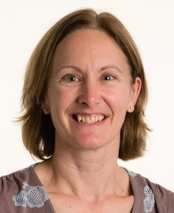 Prof Denby’s research is focused on understanding and enhancing plant disease resistance and she brings a wealth of international experience to the role. She has worked in the USA as well as South Africa, before returning to the UK ten years ago. At Warwick University, as a member of the Warwick Systems Biology Centre, and more recently the Warwick Integrated Synthetic Biology Centre, Prof Denby has worked with mathematicians and engineers to generate novel biological insight and develop approaches to enhance plant breeding. John Crawford leads the UK’s Science and Technology Facilities Council Agritech In China Newton Network+ that aims to coordinate UK agritech research collaboration with China and stimulate new public-private partnerships between UK and China Businesses and research centres. He led the development of the UK Government’s National Centre for Excellence in Agricultural Big Data and Sustainability, Agrimetrics, in partnership with over 200 industry and academic organisations and was interim CEO. John has more than 15 years’ experience in contributing to the strategic direction of UK science funding, and contributed to developing approaches to foster collaborations across the life & physical sciences interface. He has led the establishment of six interdisciplinary research Centre’s, most recently leading the computational life science theme at the University of Sydney’s $500M flagship Charles Perkins Centre for research on food, diet and health. His main research interests are in the soil-plant-microbe system and whole-systems approaches to agricultural science. His grantmanship exceeds £50M and he has published more than 190 peer-reviewed papers, with an h-index of 47. He was elected a Fellow of the Institute of Mathematics and its Applications in recognition for services to mathematics in 2003, and a Fellow of the Royal Society of Edinburgh in 2007 in recognition of his contribution to science. Mark Swainson is Deputy Head of the National Centre for Food Manufacturing (NCFM) and lead for Higher Education and Research. Before joining the University of Lincoln Mark developed an extensive industrial food manufacturing background working in senior Operations and Technical roles within the high risk chilled & frozen food industry and related retail and food service supply chains. Since joining the University of Lincoln Mark has worked to develop the NCFM's food industry based research and related facilities, consciously building a centre reputation for addressing specific food industry challenges. Mark's role also particularly involves design, development and delivery of the Higher Education provision at the NCFM including a new range of Degree Apprenticeships, all focused on the particular requirements of the Food Manufacturing sector. John Basset has nearly 20 years’ experience of risk assessment and risk management, in both industry and government roles. A veterinarian by training, he brings a “farm to fork” perspective on food safety challenges. He currently juggles two main roles; he is the Policy and Scientific Development Director with the Institute of Food Science and Technology, developing and communicating scientific policy on behalf of the institute, and also runs his own consultancy, John Bassett Consulting Ltd, which works with clients in the commercial food industry as well as governments and inter-governmental agencies. John is particularly passionate about the practical use of ‘risk-based’ approaches in innovation and food safety management systems, for industry and in the application of optimal regulatory models – he is currently a member of FSA’s expert advisory group supporting the ‘Regulating our Future’ activity. Professor Aled Jones PhD MA BA PGCert FRSA FHEA is the inaugural Director of the Global Sustainability Institute (GSI) at Anglia Ruskin University. The GSI is an internationally recognised research institute, with a group of 40 individuals. Prof Jones’ work in climate finance has been recognised by the State of California and he has received a key to the city of North Little Rock, USA. He is a Co-Investigator on the ESRC Centre for the Understanding of Sustainable Prosperity (CUSP), the AHRC Debating Nature’s Value network and the EU H2020 MEDEAS project. In 2013 Anglia Ruskin University won the International Sustainable Campus Network Award for integrating sustainability and was shortlisted as Sustainable Business of the Year for the edie 2017 awards. Prof Jones’ research particularly focusses on the finance sector and government and how they will respond to the impacts of global resource trends and climate change. He was lead author on the seminal report on resource constraints to the Institute and Faculty of Actuaries in 2013 and is now leading a team to build a global model to explore political fragility from resource crisis. Prof Jones is an External Panel member of the HRH Prince of Wales Accounting for Sustainability (A4S) group and sits on the Scientific Advisory Group for the Global Food Security initiative which feeds into the UK research councils and across government. He was a member of the UK-US Taskforce on the Impact of Extreme Weather on US/UK Food Security and a President Bill Clinton Distinguished Lecturer. Prof Jones has a PhD in astrophysics from the University of Cambridge. Seb Oliver is Director of the Data Intensive Science Centre in the South East Physics Network (DISCnet) a new STFC funded Doctoral Training Centre expected to train ~60 PhD students across 5 Universities. He also Directs the Data Intensive Science Centre at University of Sussex (DISCUS), a research unit built to address real social and economic challenges by applying data interpretation techniques. He is also Chair of STFC’s Education, Training and Careers Committee (ETCC. His academic background is as a Professor of Astrophysics in which role he currently leads a €2.5M, European Commission funded programme “The Herschel Extragalactic Legacy Project, HELP”. His expertise is in large surveys of the sky, especially using space telescopes sensitive to infrared radiation. He exploits a variety statistical analysis techniques to analyse these large data sets to probe the evolution of galaxies over cosmic time. He over 250 papers in refereed journals, with over 17,000 citations and an H-­index of 70. He has applied data analysis techniques from astronomy to a number of areas including, recently, dementia diagnosis. With DISCUS he is currently working with researchers at Sussex exploring data analysis approaches to Global Challenges. Stephen Serjeant is a Professor of Astronomy, an Observational astronomer / astrophysicist. He has published over 240 academic papers with a total of over 11000 citations, as of July 2016. Hirsch index: 54. He is the author of Observational Cosmology, an advanced undergraduate textbook published by Cambridge University Press. Stephen is currently Professor of Astronomy at the Open University. Sarah Rogers has been the ISIS-STFC SANS Team Leader since September 2015 and the Instrument Responsible for Sans2d beamline since May 2010. She has been a facilities scientist on small-angle beamlines since August 2006, firstly as a junior beamline scientist on I22 at Diamond Light Source (DLS) Ltd and later joining ISIS as a member of the SANS team in February 2008. Before arriving at Diamond she was at the University of Bristol in the School of Chemistry, where she was undertaking an EPSRC funded PDRA position in the lab of Professor Julian Eastoe, studying the formation of gold nanoparticles in supercritical carbon dioxide. Prior to this she completed her PhD in the same lab in 2005. Sarah also obtained her MSci in Chemistry from the University of Bristol in 2002. In addition to her duties as an instrument scientist, Sarah has an active research program in the areas of surfactant chemistry, ferrofluids, nanoparticle synthesis, ionic-liquids and supercritical carbon dioxide and is currently a co-investigator on several grants in these areas. Sarah is a named author on over 90 scientific publications and currently has an H-index of 19. ​Professor Ernesto DR Santibanez Gonzalez has over 20 years of experience in education, research, development and innovation projects that have been developed in different countries around the world including Angola, South Africa, USA, and several Latin-American countries such as Argentina, Bolivia, Brazil, Chile and Ecuador. Ernesto's main interests are to collaborate with organisations to strengthen and improve the institutional R&D&I capabilities, to develop high quality teaching activities coupled with technology transfer activities that generate innovative solutions to relevant and real problems. Ernesto integrates mathematical models, solution methods and technology to solve real problems in areas such as sustainable development, supply chain, manufacturing, servicing, energy and network systems. In particular, research areas of interest are Sustainable Supply Chain, Decision Support for Sustainable Development, Resilience and Sustainability, Supply Chain Optimization, Logistics, Transportation, Operations Management, Non-collaborative networks, Mathematical Modeling and Optimization, and Applied Disruptive Technology. Simon Baty began his career in pharmaceuticals, and holds a degree in Applied Chemistry. Before joining the KTN in 2013, he was business development manager for the Food and Environment Research Agency (an executive agency of Defra) in York, where he was responsible for increasing income from Non-UK Government organisations through the creation of new offers and the application of scientific skills and approaches in the food industry. At KTN, Simon helps to drive innovation by connecting people and businesses in the agrifood sector and is also the coordinator of the Defra initiative the Food Innovation Network (FIN). Mark Reed is Professor of Socio-Technical Innovation and Director of Engagement & Impact in the School of Agriculture, Food & Rural Development at Newcastle University, in a HEFCE funded Chair as part of N8 AgriFood. He is a Visiting Professor at University of Leeds and Birmingham City University, and is Research Lead for the International Union for the Conservation of Nature's (IUCN) UK Peatland Programme. He runs a spin-out company, based on his research on stakeholder and public engagement, training researchers how to embed impact in their research at: www.fasttrackimpact.com. Alison Fletcher is the Project Manager for the STFC Food Network+ as well as for N8AgriFood in Manchester. Alison has worked in Project Management in the Higher Education field for many years and comes with strong experience of bringing diverse groups together into collaborative working environments. Alison takes care of the day to day management needs of the SFN and is the first point of contact for any general queries.